New statistics show the U.S. war on marijuana is far from over. Law enforcement officers made just over 700,000 arrests on marijuana-related charges in 2014, according to data released by the FBI on Monday. Of that total, 88.4 percent -- or about 619,800 arrests -- were made for marijuana possession alone, a rate of about one arrest every 51 seconds over the entire year. While the national conversation about marijuana continued to shift in 2014, with recreational weed laws fully in effect in Colorado and Washington -- and measures to legalize the plant being passed in Washington, D.C., Oregon and Alaska -- the year also saw a reversal in a seven-year trend of largely declining possession arrests. The 2014 figures mark a minor uptick from 2013, a year that saw 609,570 people booked on possession charges alone. Arrests for possession, however, have generally been trending downward since 2007, when they reached an all-time high of 775,137. 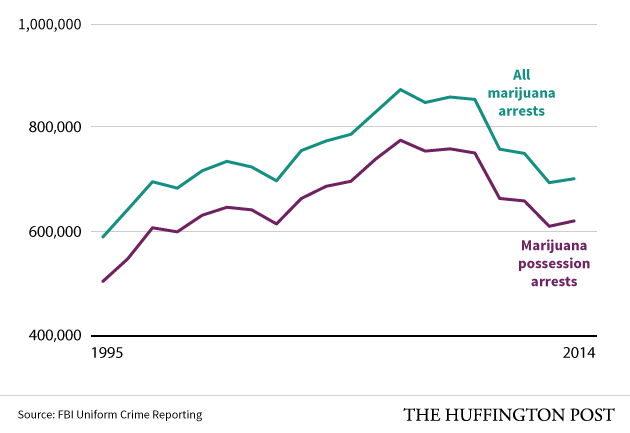 At the same time, arrests for the sale and manufacture of marijuana also continued to decrease in 2014. These arrests reached an all-time high of 103,247 in 2010, but they've since been falling, reaching a nearly 20-year low of 81,184 last year. Overall, 44.9 percent of drug arrests made in 2014 were on marijuana-related charges. Marijuana possession arrests alone made up 39.7 percent of all drug arrests and more than 5.5 percent of all arrests made over the year. More than 83 percent of total drug-related arrests were made for possession alone, with nearly 17 percent of arrests for sale and manufacturing. With public support for legalizing marijuana reaching a record high earlier this year, Tom Angell, chairman of the drug policy reform group Marijuana Majority, said the new marijuana arrest figures show law enforcement priorities aren't in line with the nation's. "It's unacceptable that police still put this many people in handcuffs for something that a growing majority of Americans think should be legal," Angell said. "A record number of states are expected to vote on legalizing marijuana next year, so we hope and expect to see these numbers significantly dropping soon." Voters in a number of states may consider legalization measures at the ballot in 2016, including Arizona, California, Massachusetts, Missouri and Nevada. Pot policy reformers have also expressed optimism that lawmakers in other states may legalize marijuana. Angell also pointed to FBI data showing that clearance rates for a number of violent crimes have been historically low in recent years. More than a third of murders went unsolved in 2014, for example. "There’s just no good reason that so much police time and taxpayer money is spent punishing people for marijuana when so many murders, rapes and robberies go unsolved," Angell said. Kevin Sabet, president of Smart Approaches to Marijuana, a group that opposes the legalization of weed, downplayed the significance of the FBI numbers, however, and noted that people are no longer being thrown behind bars for low-level marijuana possession. "Those getting arrest violations are usually people who are using out in public, being pulled over for driving and using, etc.," he said. "What alcohol legalization teaches us is that by simply legalizing a drug we are not guaranteeing fewer arrests -- indeed in the case of alcohol we have more arrests than ever." Indeed, while marijuana-related penalties have been scaled back in many places over recent years, restrictions on public consumption, display or possession over a certain amount are still on the books. But while getting arrested for marijuana possession in 2014 would likely have had less serious consequences than it might have ten years ago, these arrests still come at a significant cost to the legal system at large and to individuals. Authorities spend more than $3.6 billion each year enforcing laws against marijuana possession, according to a frequently cited report by the American Civil Liberties Union. And while people who get arrested for possession may not face jail time for that charge alone, getting caught up in the U.S. criminal justice system often creates a cascading set of problems -- including getting fired, long-term financial problems and even jail time for unpaid fines. People who are already financially disadvantaged, as many of those arrested for possession tend to be, are most likely to be affected. There's still a long way to go on the issue of reforming marijuana laws to address the root of these problems, according to Mason Tvert, director of communications for the Marijuana Policy Project.